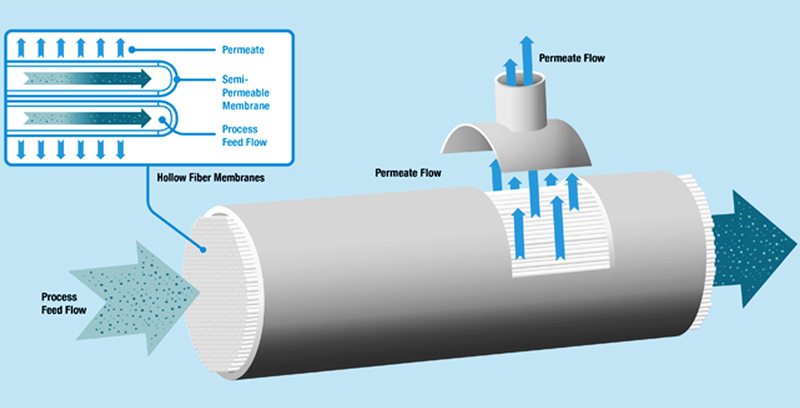 TARGA II Membranes: Setting a new standard in water treatment. The latest in our broad family of hollow fiber ultrafiltration products, the TARGA II membrane is now even better at tackling a wide range of industrial and municipal water treatment applications. The TARGA II membrane provides safe, high-quality solutions for drinking water, seawater pretreatment, industrial water treatment, and tertiary wastewater treatment. The TARGA II membrane design is based on polyethersulfone (PES) chemistry to increase chlorine tolerance, and it has one of the highest membrane packing densities per cartridge available in the market. The TARGA II membrane design is based on polyethersulfone (PES) chemistry to increase chlorine tolerance, and it has one of the highest membrane packing densities per cartridge available in the market. Ideally suited to meet drinking water requirements, the TARGA II membrane achieves 4-log virus removal. Its highly intelligent process controls handle fluctuating feed flow with minimal operator intervention. With such innovative advantages, the TARGA II membrane is setting a new standard in water and wastewater treatment.